Not just another potato salad….. The secret step in this Potato Salad is pouring French Dressing over the cooked potatoes while they are still warm so the potatoes absorb the vinaigrette flavour. 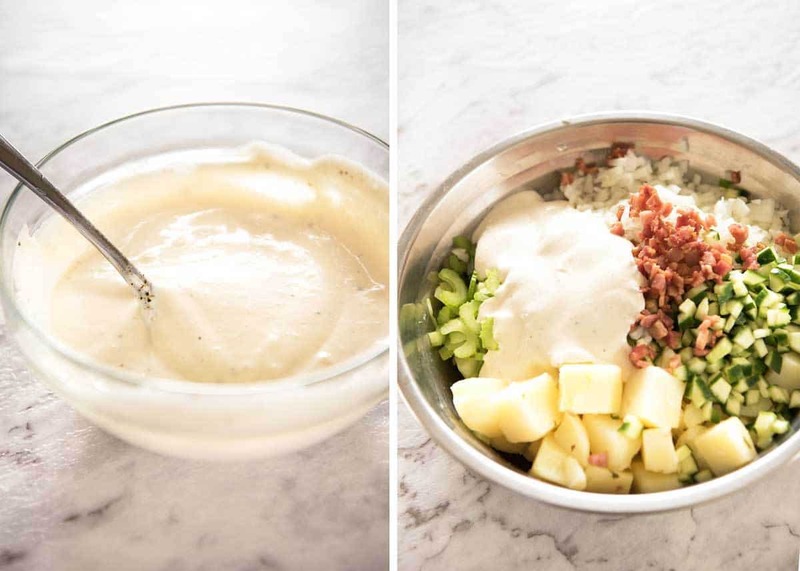 For a lighter dressing option, try a No-Mayo Creamy Potato Salad Dressing made with yogurt! This recipe is from the mother of a good friend, and thus I originally named this recipe in her honour, calling it Mrs Brodie’s Potato Salad. The very first time I heard how Mrs Brodie makes her potato salad, I instantly knew that this was one that would stand out from the crowd of thousands – millions – of potato salad recipes “out there” in the world wide web. The thing that makes this potato salad so special is pouring French Salad Dressing over the hot boiled potatoes. By doing this while the potatoes are hot, they absorb the French Salad Dressing flavour rather than just coating them. 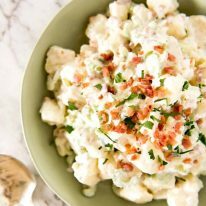 Combined with the creamy mayonnaise dressing, salty bacon, and fresh bursts of celery, cucumber and onion, every mouthful is The Perfect Bite. 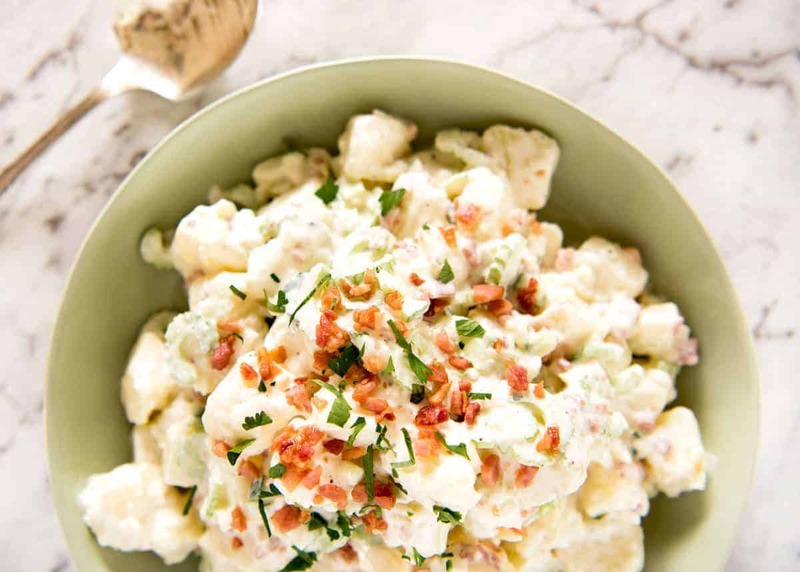 The other thing I really like about this Bacon Potato Salad is the dressing. It isn’t just mayonnaise, it is lightened up a bit with sour cream plus it has a mild kick from Horseradish Cream. Mrs Brodie’s recipe calls for Horseradish Relish which is stronger. However, this is quite hard to find here in Australia so I substituted with Horseradish Cream. For a healthier option, try a No-Mayo Potato Salad Dressing. It’s made with yogurt and it’s terrific! 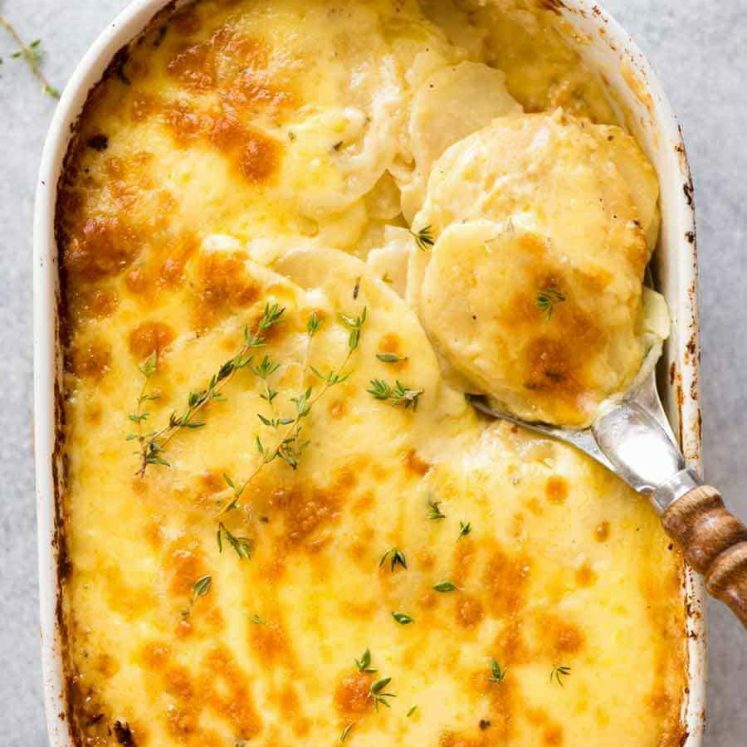 When I first saw this recipe I thought the raw onion in it would be too sharp but you can’t taste onion at all once it has melded in with the Potato Salad Dressing. It balances out the creaminess of the dressing and you can hardly tell there is onion in it. This potato salad will last 4 to 5 days in the fridge, and it just gets better. I highly recommend making it the day before if you can, or at the very least a few hours before serving to give the flavours a chance to develop. Pearl Couscous Salad <– personal fave! Wild Rice Salad <– reader fave! Lemon Potato Salad – a terrific mayo free option! 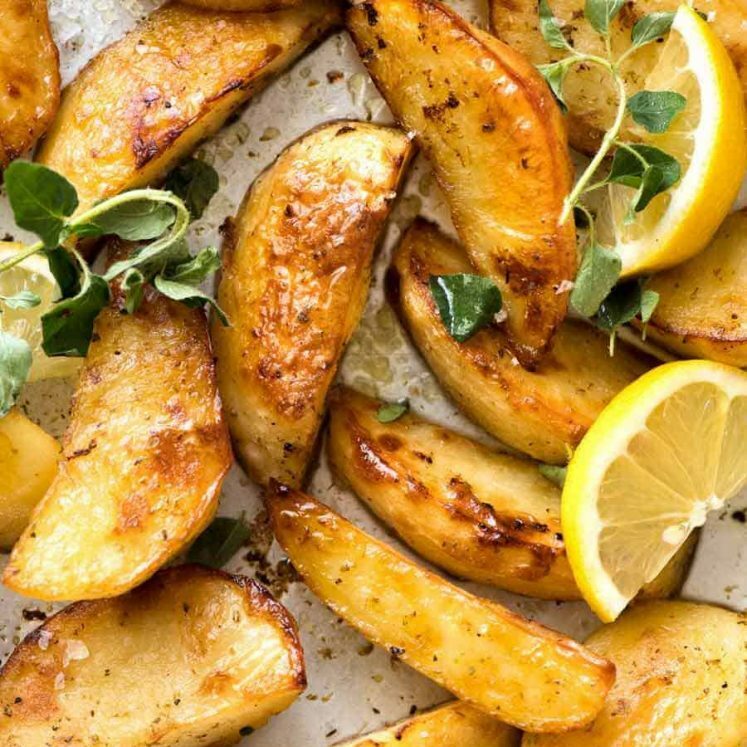 Crispy SMASHED Potatoes – a crowd favourite! The secret step is the French Salad Dressing which is poured over the potatoes while they are hot so they absorb the flavour. You can use homemade or store bought French Salad Dressing. 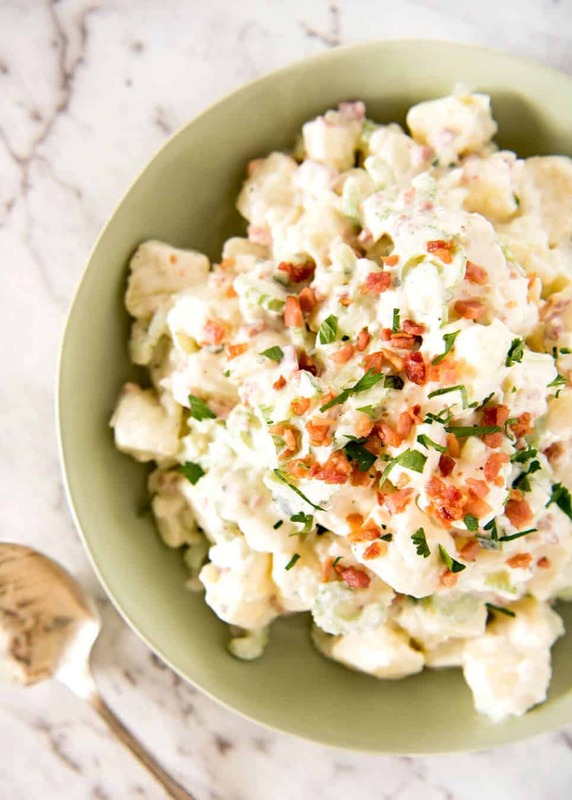 This potato salad will last for 4 to 5 days and just gets better. It is best made at least a day ahead, or at least a few hours before serving. Serves 6 to 8 as a side. Combine the French Dressing ingredients in a jar and shake until well combined. 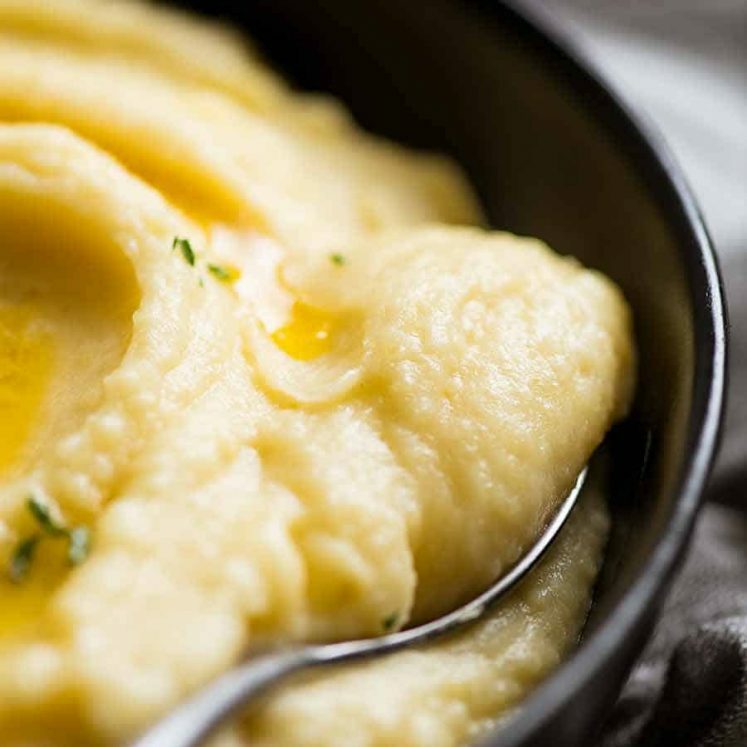 Combine the Potato Salad Dressing ingredients and mix well. Heat 1 tsp oil in non stick pan over high heat. Sauté bacon until crisp, remove from pan and place on paper towel to absorb excess oil. Bring a large pot of salted water to boil. Put the potatoes in, bring back up to boil then cook the potatoes for 5 minutes. Drain the potatoes then place in a large bowl. Immediately pour the French Dressing over the potatoes and very gently toss to coat all the potatoes. Once the potatoes have cooled, add the remaining Potato Salad ingredients and pour over the Potato Salad Dressing. Toss gently to combine. Set aside for at least a few hours, preferably overnight, before serving to give the flavours a chance to develop. Store covered in the fridge. 1. The best potatoes to use for potato salad are waxy potatoes as they hold their shape and do not break down and become fluffy when cooked. Good all rounders work well too. In Australia, the best potatoes to use are (in order of preference): desiree, red pontiac, sebago (the ones covered in dirt). In the US: red potatoes, yokon gold, round white potatoes, long white potatoes, russet (the ones covered in dirt. A very common all rounder in the US but it has a higher starch content than other all rounders). 2. The French Salad Dressing for this recipe is slightly different to the usual salad dressing because I add a bit of water to thin it and there is a slightly higher vinegar to oil ratio. This is because the standard homemade French Salad Dressing is thicker than store bought. It needs to be thinner so it is easily absorbed by the potatoes. I’ve just made this but omitted the bacon (didn’t have any) and celery (not that keen) and I’ve put it in the fridge to let the flavours mine but can already tell that it is blinding. Love the idea of the French dressing mixed in with the potatoes whilst hot. I used Charlotte potatoes and they have kept together great after boiling for 5 minutes. Finally I’ve made a potato salad that’s as good as Marks and Spencers! Should I peel the red potatoes or leave skin on? I ran out of white potatoes, used half sweet potatoes…with the special sauce … so yummy! That will always be my potato salad recipe. When making potato salad I mince an onion and add it together with white vinegar pored over the hot sliced potatoes and mixed in well. When it cools down to room temperature then I add a dressing of mayonnaise, plain yogurt, lots of coarsely ground black pepper, salt and fresh minced dill. If you don’t have dill you can use fresh minced parsley. This has been my recipe forever. To change it up you can add a couple of chopped boiled eggs and if you like, some Coleman’s mustard mixed in the dressing for a deviled taste. Oooh yum! I love that idea Diane, thanks for sharing!! Hi Nagi, I made a half quantity of this last night to test before Christmas lunch. My partner and I thought it was so good we ate most of it with our dinner, saving some for the obligatory overnight taste and OMG! 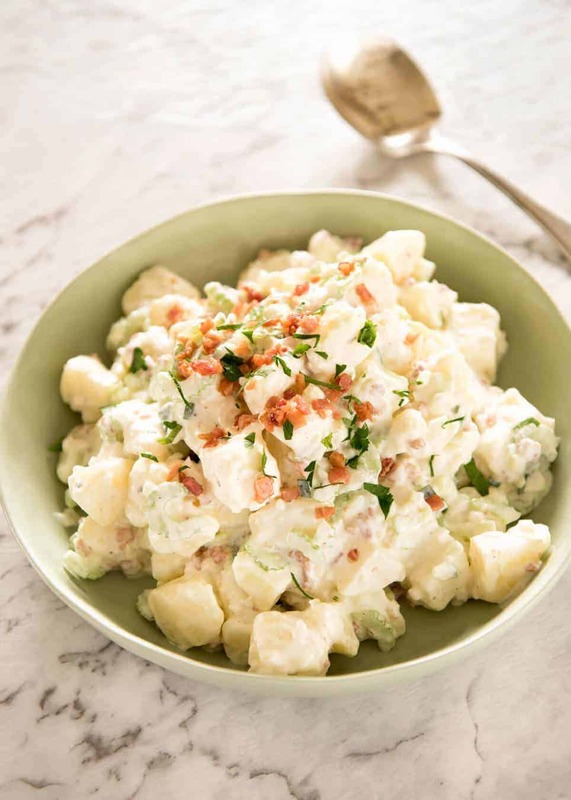 Left overnight this potato salad blows all other potato salads out of the water! It really is best to wait. I phoned my mother who lives in another state and asked her if she was planning on making potato salad for Christmas lunch, which she is, so I’m sending her the recipe. So that’s two households that will be eating this for Christmas lunch because it’s definitely going on our table. Mrs Brodie, I’m hopelessly devoted to your potato salad. Nagi, thanks for sharing it. OMG!! This will be my ‘go to’ potato salad recipe from now on. Thanks, Nagi. I love your recipes. I was just wondering if horseradish relish is the same as just jarred ground horseradish?? I don’t think I’ve ever seen horseradish relish or cream in my stores. Hi Susan! Apparently it’s thinned down horseradish 🙂 If you can’t find it, this is still definitely worth making! I found horseradish cream in the supermarket next to the mustard. this salad sounds interesting and definitely a must try. However I don’t understand what a “brown” onion is. Is it a regular onion that is referred to as “brown” because of the outer covering? Wow love it. My daughter was upset as someone put bacon in our Christmas lunch potato salad so I promised her I would make a vego option the next day. Short of time I just dressed the potatoes in the French dressing then just added two boiled eggs, spring onions, parsley, dill pickles and plain yoghurt. Yum. Hi Nagi! I am loving everything about this potato salad!! I always dress my potato salads when the potatoes are still hot and they must be made day ahead, just one of many things that are better leftover! My old standby has chunks of dill pickle in it. Looks delicious! Potatoes are my favourite vegie! I will have to try to make this for my next picnic. I tried potato salad with sliced ham in it but not with bacon. Must try. I hope you do try it – MUM!! Thanks so much Kenji! Definitely the best potato salad I’ve ever had! No better than you Padaek! And champagne, shoes and food…..the perfect trio! love potato salad! can’t remember the last time i made one.. definitely going to be trying this recipe. thanks! Potato salad is definitely not a regular on my rotation but when I do make it, this is the one to use!! I love love love this recipe. My friend’s mum is the best! Great looking salad you got there, Nagi. I love that you used sugar to balance out the dressing. I wish I knew or remember what horseradish tastes like though! Pretty sure I’ve had it before!